We are back to 3 months ago, the moment when Pops told to the gang leader about his plan, the last chance where they will prove of what they are made of! 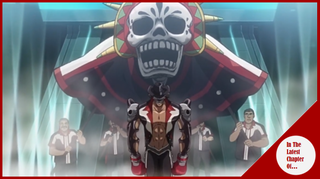 Fujimaki doesn´t believe him and tells him that he needs something more… Then Fujimake tells him of his plan, Joe doesn´t need to win Megalonia, just go there…Then he will take care of the rest. Back in the present, Joe and Sachio aren´t truly happy about hearing that; Pops tries to explain and softening the blow by saying that now, after seeing him fight, he knows that Joe is the real deal, and this is not the end of the round, it will be just a detour! After that Joe can be big and challenge Yuri in another opportunity! But now…He just needs to listen, Pops gives him the auricular, which Joe throws to the ground and after that punches Pops in the face! Joe rides his bike and decides to leave, he is done and disappointed in Nanbu, he was wrong on believing in him, and leaves, At the same time Sachio can´t believe it and ask Nanbu if he is joking?! Nanbu shrugs him off, before leaving Fujimaki comes close and looks at Sachio, who starts running. The gang leader tells Pops that the fight and the result needs to happen, because if not… Pops won´t be the only one sleeping with the fish; Joe and that Kid will go with him. The next day, the Press conference is being held where the 4 contenders of Megalonia participate; Pepe is talking in Spanish about how he basically will defeat Yuri while Burroughs says some nasty stuff to Joe, our Hero is absent in such meeting since he is in that repaired shop watching; that man says that he is impressed to seeing JD here, he though he will never be back… 3 months surely flies…Still, he has a question for Joe… For whom should he bet on? Gearless Joe or Glen Burroughs? A little in the past, Pops was talking with that person who was working with Shirato before being fired, he tells him about a guy, Sachio´s Father, who was a genius engineer, that without his investigations the integrated model, the one Yuri uses, couldn´t be made; still… Sadly someone at Shirato took his investigation and killed Sachio´s Dad. Back in the present, Nanbu asks the Kid what happened to her Mom? Sachio says that she got sick and died a year later… So what he wants is vengeance against Shirato! And if Joe wins, his revenge will come! Pops then tells him that he can´t do much about Joe´s situation; but if he wants revenge, he can help him to obtain it. Nanbu takes Sachio to a nice neighborhood, in one of the yards behind a mansion, a nice party is being held, one with Yukiko Shirato. Pops gives the Kid a knife, he tells him that if he goes and if he is fast he can kill her without problems and his revenge will be done… Sachio takes the knife and sees the sharp edge, his heart is filled with anger and determination, he turns and sees Yukiko! The leader of Shirato group is talking with some kinds and is showing to be nice with them, she is smiling and having a good time with such infants, the image of that woman being nice with kids, like a mother, has softened Sachio´s Heart and he starts crying unable to move; then the Kid tells Nanbu that he won´t do anything…His revenge will come with Joe anyway. Pops says that if that´s the case then he has an idea…Especially because Fujimaki is no joke; but still is probably that his reach can´t get to the higher ups of Shirato. Later that day, Pops has come to Yukiko´s house, he is asking her to take in and protect Sachio; Yukiko wonders why he wants that? Especially in the way his team has been acting all this time , how they presented and how Joe didn´t appeared in the Press conference… Still Pops is sure that she will take Sachio in, since he is related to someone who was an integral part on the Integrated model design, she can look it if she wants… Yukiko sees the kid and his eyes reminds her to Joe, that time she meet him for the first time, in the end Yukiko takes the Kid in; Pops gives his thanks and finally tells Sachio that this is the last time they see each other, so he better take care of himself! The first fight of Megalonia is about to begin, Pepe Iglesias Vs. Yuri! The introductions are made and the battle is about to begin! In the distance, Joe is watching the fight while Pops is just getting drunk in a bar; Sachio has locked himself on his room and refuses to get out. Yukiko meanwhile is watching the match alongside the military people, her Secretary tells her that it seems that Sachio is indeed linked to a worker of the integrated model who was vanished, Yukiko just says that the responsible people will be deal with later. The match starts and Pepe is doing some very fast punches against Yuri, still Yuri doesn´t move a lot! Finally, Pepe is able to land a hit on Yuri´s humanity! Now it´s the time for Yuri to attack and in one single punch he is able to win by K.O. Defeating the Mexican boxer. After the match, Yukiko makes her movement in order to give credit to Sachio´s Dad; meanwhile Joe is about to leave until a friendly dog comes and see him, he soon sees that it was Yuri´s Dog; the King of Kings tells JD that his dog doesn´t usually is friendly with strangers… Joe then speaks about the fight and how the hit he did against Pepe was amazing! Still the conversation continues and Yuri asks him why he is doing what he is doing? Joe explains that being “Gearless” was just a bluff in order to gain attention, although right now he feels that gimmick is part of himself, besides, he likes those fights, to feel his blood pumping. Yuri, on his case, he says that he is in here just to show gratitude to the only person who believed in him, she took him when he was a nobody, and is thanks to her that he is here… That is all. Another amazing chapter of Megalo Box! I liked all the drama that has come; plus we are seeing the end of the different story arcs that are happening right now, especially with Sachio, who I think we won´t be seeing much anymore of him since his story is almost done. Talking about Sachio, I truly liked the scene when Pops gives him the knife and tells him that if he wants he could get revenge against Shirato for what happened to his Dad; but still he decided against it when he saw the children… He is not as shady as the Shirato group, he can´t kill someone and drag innocent people with him… So he decided to not do it. His revenge will be via Joe, when he face Yuri and eventually defeats him. Now on the fight scene…Man poor Pepe! I thought he would have more of a challenge against Yuri; but sadly that wasn´t the case! Also his accent was Spaniard, not Mexican or Neutral Spanish; but hey! If in Resident Evil 4 the Ganados have Neutral accent while they are in Spain, then I guess this is fair. Now the last topic is this whole drama that is happening with Joe and Pops, the whole big setup and… Knowing Ashita no Joe, yeah… The ending is not truly a happy one so… A similar thing could happen on this series, either the Cinderella´s dream end and Joe loses against Burroughs, or he wins; Pops will (probably) be killed while Joe manages to get to his match against Yuri (since if that happens Fujimaki will try to kill him too) and manages to fight… Either way, the thing looks to be very dramatic. Oh and a little thing… If you want some anime merch; but you can´t find it, or maybe some Super Sentai figures at good prices… You can get them on my Friend´s store ZST Store! A place with nice prices and a lot of interesting stuff! So if you have some time check it out!